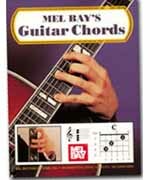 This book is considered to be the largest selling basic guitar chord book ever published! Twelve basic guitar chord types are shown in three ways: photograph, notation, and chord diagram. In addition, a special bonus section is contained showing in photo and diagram the essential moveable rhythm guitar chord forms. This special section contains the basics of Mel Bay's acclaimed Rhythm Chord Playing System showing the guitarist how to finger numerous advanced chord forms with a minimum of hand movement! Chords shown in photo, notation, and diagram form include Major, Minor, Dominant Seventh, Diminished, Augmented, Ninth, Major Seventh, Minor Seventh, Seventh #5, Seventh b5, Sixth and Minor Sixth. Chords are chown in the bonus Moveable Rhythm Chord section include Major, Minor, 7th, Minor 7th, 7sus4, 7b5, 7#5, Minor 7b5, Sixth, Minor 6th, Diminished 7th, Diminished add 9, 9th, Minor 9th, 9b5, 9#5, Minor 9b5, 7th b9, 7th b9#5, 11th, 9 add 6, Minor 9 add 6, 13th, 13sus11, 13 b9, 13th b9 b5.